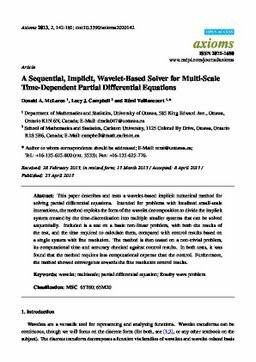 This paper describes and tests a wavelet-based implicit numerical method for solving partial differential equations. Intended for problems with localized small-scale interactions, the method exploits the form of the wavelet decomposition to divide the implicit system created by the time-discretization into multiple smaller systems that can be solved sequentially. Included is a test on a basic non-linear problem, with both the results of the test, and the time required to calculate them, compared with control results based on a single system with fine resolution. The method is then tested on a non-trivial problem, its computational time and accuracy checked against control results. In both tests, it was found that the method requires less computational expense than the control. Furthermore, the method showed convergence towards the fine resolution control results.